Prevent Hair Loss from Weaves and Braids! Beauty hurts, but sometimes it goes beyond "normal" pain. Hair loss is not by any means normal, and it is definitely a sign that something has gone wrong. There are millions of people that wear weaves, braids and hair pieces on a daily basis without incident, so it does not mean that weaves are bad in and of themselves. Some women experience hair loss due to weaves because they have been improperly installed or they wear them too often. 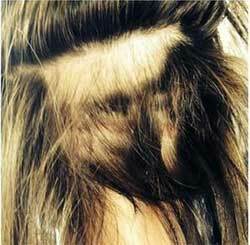 The result of such condition called traction alopecia. Traction alopecia is a scalp condition that can cause hair loss, pain and soreness around the forehead, and even bumps and flakiness in the scalp. This particular type of alopecia usually causes temporary hair loss due the hair style and the hair will likely grow back as long as it is corrected in time. Traction alopecia can be caused by weaves, braids (micro braids close to scalp), or extensions that have been installed too tightly or left in for too long. There are many ways to detect traction alopecia prior to hair loss. The main sign is pain, or stress along the hair line during or after the installation of the weave, braids, or hair extensions. It is vital that the client makes sure that the beautician is aware that the style is too tight and uncomfortable while they are doing it because that will prevent problems later on. If the client realizes that the style is painful later, then they should have it removed because it will do more damage the longer it is putting tension on the hair. Some other signs of traction alopecia can include painful red bumps, pus, or flaking in or along the scalp. Weaves, braids, and extensions are safe to wear, but even under the best conditions they are only to be left in for a couple of weeks at the maximum and then the scalp should be left alone for a couple of weeks after that to recover. The reason why a lot of women have traction alopecia is because they will try to wear these types of hairstyles too often without giving their hair a break. Ideally, the hair should be able to rest in a natural state for a couple of weeks after getting a weave or a similar hair style. If there are any signs of tension, pain, or stress along the hair line, then the weave should be adjusted or removed altogether. Here is one example of weaves horribly gone wrong by bad application and low quality hair weave. 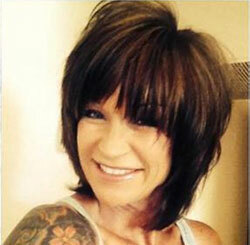 Fortunately 80% of client's hair was saved by professional team at Got Roots Salon in Mesa, Arizona - Give hair a fantastic haircut and some time, all can be healed! Traction alopecia is preventable as long as weaves, braids, or extensions are installed properly by weave/extension specialist and they are worn for a limited time. Beauty salon clients should always have a full consultation with chosen stylist in order to discuss the suitability of style and length and be vocal about how they feel as their hair is being styled because the styling process is not supposed to be painful in anyway. If there are more serious problems in the scalp area, then it is recommended that they visit a licensed dermatologist to express their concerns.